Once again, we are heading into another critical week in the Brexit saga. As Britain’s path out of the European Union goes through multiple twists and turns, there are still at least three possible outcomes, even with Brexit day (March 29) only eleven days away. With this level of uncertainty, businesses must prepare for all eventualities. The original Brexit day of March 29 will most likely be delayed, as neither the UK nor the EU will be ready for a breakup on that day, even under a “no deal” scenario. Instead, a modest “technical” extension until sometime in June will allow both parties to complete preparations for a less chaotic Brexit. Key decisions will not be made until the European Council summit on March 21-22. Under almost any circumstance, Prime Minister May will go to that meeting to request an extension. All 27 EU members must agree; and also agree to the length of extension. There is increasing discussion of a long extension (about a year) of the Article 50 process (by which Britain leaves the EU). But a “no deal” scenario, in which the UK simply leaves the EU with no agreement in place, is still a very real possibility, one for which business must prepare. In preparation for a “no deal” scenario, this week the UK government also published tariff schedules and a plan for managing goods trade across the Irish border. Last week, Prime Minister May put her plan (including the Withdrawal Agreement negotiated with the EU) before the Commons for a second time. Again, it went down to defeat, 391 to 242 – although that was better than the first attempt, which failed 432 to 202. The next day, Wednesday, the Commons voted against leaving the EU with “no deal”; that is, with no withdrawal agreement in place. However, that vote does not change the reality that it is the EU27 that will determine whether an extension can be granted to the UK; otherwise, Britain will leave without a deal on March 29. On Thursday, the Commons voted against a motion to ask for a delay to conduct a second referendum. But the Commons did support, by 412 to 202, a government motion to request an extension. The motion stated that if the (twice-defeated) government plan was passed by March 20, PM May would ask for a short technical extension until the end of June. However, if it was not passed, she would ask for a longer extension, perhaps a year, to allow Parliament to develop a consensus. With these votes as backdrop, May expected to put her plan before the Commons for a third attempt on Tuesday or Wednesday. However, on Monday, Speaker John Bercow ruled that the government’s motion was insufficiently different from the one defeated on March 13, and so could not be resubmitted to the Commons for another vote. If this ruling holds, the Prime Minister might decide to hold a vote only after returning from the Brussels summit, presumably with offers of an extension that can be included in the package. Scenario 1: The PM’s Plan is Approved and Brexit is Underway – PM May has pursued a strategy of narrowing options until Members of Parliament are faced with a choice between her plan (including the EU Withdrawal Agreement) and something truly unpalatable, such as no Brexit. She may now have her moment. If her plan is approved this week, she will ask for a short, three-month extension in order to pass required legislation. The EU is very likely to say yes, as it also has some procedures to complete, including gaining approval from the European Parliament. If Speaker Bercow’s ruling delays the vote, the PM could ask for a short extension, and if granted by the EU27, she could put this to a new vote after March 22. The approval of the Withdrawal Agreement — either before or after the European Council — means that Britain will officially leave the EU under the negotiated terms and begin an extended transition until at least December 2020. The question is whether that will begin on March 29 or sometime in June, and this will depend on the EU willingness to grant a short extension. After Britain exits the EU and enters the transition period, all EU laws and regulations will continue to be applied in the UK, and customs and tariff arrangements will stay as they are now. The only difference will be Britain’s absence at the decision-making table. Also during the transition, the EU and UK will negotiate a Free Trade Agreement and customs arrangement that will be key to their future relationship. For businesses, the status quo will apply until at least December 2020, but there will be much uncertainty about future trade and customs arrangements as negotiations proceed. Scenario 2: The Long Extension – If the PM’s plan is not passed by March 20, she has said that she will ask the EU for a longer extension of Article 50’s deadline to leave the EU, perhaps as much as a year. While there have been some reports recently that the EU would support a long extension of the March 29 deadline, it should be remembered that all 27 must approve any extension and its length. Unlike in Scenario 1, granting such an extension would leave the UK still as a member state, perhaps seeking to reopen the terms of the Withdrawal Agreement. This scenario is also complicated by the impending European Parliament elections (May 23-25), as the UK, if still a member state, would be expected to participate in those elections. Assuming the EU does grant a long extension, EU laws and regulations would continue to apply as now, including tariffs and customs arrangements. However, there would be increased uncertainty about the future: would a long delay in Brexit lead to a general election in the UK or a second referendum? Would the UK seek to reopen the Withdrawal Agreement or pursue a series of votes in the Commons seeking a consensus on a way forward? This scenario leads to an endless number of possibilities and could lead to a range of outcomes from “no deal” to no Brexit. For business, it would bring a period of continuity with current rules, but an even greater level of uncertainty about the future. Scenario 3: Britain Leaves the EU with “No Deal” – If PM May asks the EU for a longer extension (perhaps a year), it is also possible that the EU will deny her request. Most EU leaders are fed up with the British inability to decide what they want, and this irritation should not be underestimated. If the EU denies the request, the UK will leave with “no deal” on March 29. It is also possible that the EU might grant the longer extension, but with conditions that are unacceptable to the British. For example, the EU has made clear that if the extension goes beyond June 30, the UK must organize elections for the European Parliament, which will start its new term in July. Under an extension, the UK would still be a member state and so must be represented in Parliament. Most pro-Brexit politicians in the UK would see holding an election for the European Parliament as the first step away from Brexit and will be opposed. Thus, the EU might grant the extension, but Britain not be able to agree to accept the accompanying terms. 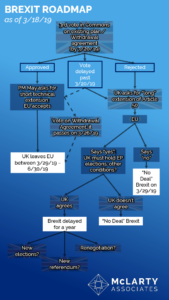 In sum, this scenario presents two different pathways, but both end at a messy “no deal” exit on March 29. Business must be prepared for these outcomes to emerge relatively quickly. Set tariffs at 0% on 87% of imports by value. Currently, about 80% of imports are zero tariff. However, this shift would mean that only 82% of EU imports would be tariff-free; currently 100% of EU imports have no tariffs. For non-EU imports, about 92% would become tariff free, as opposed to 56% currently. Specific tariffs can be found in this document, The Tariff of the United Kingdom. This arrangement would be temporary, for about one year. The UK government seems to believe this would be adequate for negotiating free trade agreements with at least a few major partners. Agriculture, including beef, lamb, and some dairy, would enjoy some protections, both tariffs and quotas, so that EU agricultural protections are largely maintained temporarily. Car parts/components would be duty free so that they could be imported to assembly plants in the UK without additional cost. However, imports of completed cars from the EU (or elsewhere) would now be subject to 10% tariff. There will be no border controls or requirement for customs declarations on goods moving across the border between the Republic of Ireland and Northern Ireland. If goods go to the rest of the UK by transiting Northern Ireland, then tariffs must be paid, but there would be no checks in the Irish Sea. This has raised questions about smuggling goods through Northern Ireland into the rest of the UK, with some saying that this situation could lead to farm goods (which would otherwise be subject to tariffs and quotas) avoiding tariffs by going through NI. It is also not clear whether having different rules for goods imported from Ireland to NI than, for example, from France through Dover, is consistent with UK WTO obligations. Thus, even though we are now just days away from Brexit becoming a reality, it is still not clear under what conditions the UK will exit the EU. Will it simply fall out of the EU, in a messy “no deal” scenario? And if that happens, will the announced tariff schedules and plans for managing the Irish border be implemented smoothly? Or will the UK request a year-long extension? And will the EU grant that request, and provide conditions which the UK can accept? Or will the Prime Minister’s deal be accepted at the very last moment, shifting the UK into a transition period, which will bring its own uncertainties? Hopefully, this week will finally provide some answers.